← Islamic Emirate: Targeting of mosques and madrassas by American invaders!! 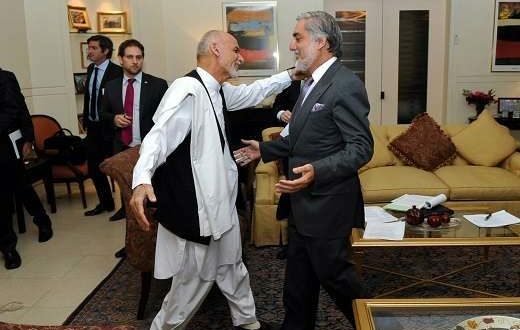 As usual, last year was full of failures and embarrassments for the heterogeneous setup of Ashraf Ghani and Abdullah. The year 2017 began while the humiliating issue between General Dostum and Eschi was the breaking and leading news in media. The aged and white-bearded deputy of Junbish party claimed that he was not only tortured and agonized but also sexually abused by Dostum and his armed militiamen. In the beginning of January 2017, some free political analysts and supporters of peace process like Faiz Mohammad Zaland, Nazar Mohammad Mutmain and Asad Wahidi complained that they were receiving text messages and phone calls from unknown numbers and an effort is made to fabricate a dossiers of having contacts with Taliban. Later it was revealed that this conspiracy was initiated by the so called national security organ of the puppet regime. Another noteworthy issue in January 2017 was the expressions of Abdul Hakeem Mujahid, the deputy head of the high peace council. He called Taliban the angels of peace, which provoked the harsh and vicious reaction of ‘Shora-i-Nazzar’ (i.e. the factional military and political northern alliance) mainly that of Abdullah and Atta Mohammad Noor. The later one demanded that Mujahid should be imprisoned and the former one claimed his dismissal from the post. But Abdul Hakim Mujahid, enjoying the support of Ashraf Ghani, blatantly rejected the orders of the so called chief executive by adding that since his appointment was signed by the so called president therefore he is the only one who can remove him from his post. In the meantime, six hundred liters of wine was discovered in Balkh province, which revitalized all those roaring debates and discussions that most stooge officials of the heterogeneous puppet regime are widely involved both in the use and trade of alcoholic drinks which are forbidden both in Islam as well as the established laws of the state. In the closing days of January 2017, an Israeli defense magazine revealed a provocative secret by publishing that Israeli drones are playing a crucial role under the emblem of NATO’s resolute support mission inside Afghanistan by relentlessly killing the innocent Afghan people on the daily basis. Though it was a deeply embarrassing and humiliating discovery for the stooge heterogeneous setup but they did not bother at least to clarify the situation as they could not dare to react on this felony or aggression against their foreign masters. At the end of this month, the body guards of Haleem Fidae, the stooge governor of Logar province ruthlessly killed innocent civilian people in the area. This tragic incident widely echoed in the media but unfortunately the blood of these people was squandered like all others. It has been nearly one year but neither the so called governor was trialled nor any of his body guards were held responsible for the incident due the impunity enjoyed by all those in power against all oppressed masses. At the juncture of January and February 2017, two ridiculous assertions were made by the puppet regime which could not hold for long and were proved baseless which, instead of benefiting, badly undermined the stooge regime. For the first time, the high ranking stooge officials claimed that a key Taliban commander Mullah Abdul Salam was killed in Kunduz province but shortly after this claim, he gave an interview and proved the white lie of the puppet regime. In the second case, a fake letter was issued by the puppet national security organ on behalf of Mullah Abdul Manan, the governor of Helmand province, stating his differences with the leadership of the Islamic Emirate. But soon after this letter was published, Mullah Abdul Manan gave a detailed interview to media, thus proving the whole story a baseless and fabricated one. In the ending days of February, media reported that a driver was ruthlessly killed by local police of puppet regime in Farah province for failing to give 20 Afghanis in bribe, which once again instigated the old discussions of inefficiency and arrogance of police forces in the media. In March 2017, media reported that visas were banned by the American embassy in Kabul for all interpreters working with foreign invading forces. Similarly, visas were denied for members of the so called national assembly delegation intended for visiting America. In the meantime social media activists reported that corpses of local armed forces killed in Helmand province were not being shifted to their families in their respective provinces by the defense ministry of puppet regime and their bodies were rotting and decaying in the battle-field. Analysts said that these forces are backed and sponsored by the high ranking officials of puppet regime so as long as they are alive and can fight to protect their vested and malicious interests. And when they die, there is no one to lament, take care of their corpses or look after their families. In March 2017, severe differences emerged between two top ranking officials of stooge admin, i.e. Atta Mohammad Noor and Abdullah Abdullah. Atta Noor who was close to Ashraf Ghani at that time, uttered severely harsh words against Abdullah by calling him a scorpion. In these days, another member of the bogus national assembly, Laly Hameedzai, who was excessively drunk got out of his home at midnight and opened indiscriminate shelling for several hours, thus spreading panic and a sense of insecurity among the people of Kabul city. Furthermore, the health ministry of puppet regime announced that 20 people were killed in Kabul in March 2017 due to use of contaminated alcoholic drinks. The human rights commission said in its report of March 2017 that police force of puppet regime is widely involved in sexual abuse of children. In the same month, sever fighting broke out in Faryab province between Naeem Cherik, a notorious commander of Junbish Party and Khal Mohmmad, an unrestrained commander of Jamiat Party in which heavy losses and casualties were inflicted on both sides. In the last week of March 2017, SIGAR (the special inspector general for Afghanistan reconstruction) announced that most of American funds are stolen, misused and wasted in different ways and not properly utilized inside Afghanistan. In the beginning of April 2017, the chieftains of ‘Shinwari Tribal Council’ said that Daish (ISIL) is widely and openly supported by the puppet regime. This claim was reiterated by Zahir Qadeer and several other local officials, but no adequate or acceptable answer was given by the stooge admin authorities. In the same month, Mother of all Bombs was dropped by the savage American invading forces in Achin district of Nangarhar province which had a widespread echo in the world media, though it was not as terribly harmful as perceived to be. The American authorities widely propagated to pretend their seriousness about the issue of Daish (ISIL), but several analysts including Karzai declared that it was only the testing of American war technology and the soil of occupied Afghanistan was chosen only as a testing ground. Another issue which resulted in roaring disputes inside the stooge admin was the dismissal of Zia Masood, special envoy of the stooge head for good governance. Zia Masood, who came to know his sacking through media, warned about his fierce reaction and resistance but practically he showed little. On Thursday 4th May, Gulbadin Hikmatyar entered Kabul and surrendered to the stooge admin of Ashraf Ghani in the wake of an non-guaranteed deal. Some of his followers were quite enthusiastic at that time as they were promised prestigious posts in the stooge setup including a separate new housing enclosure. But it was later revealed that just like Dostam and Zia Masood, Hikmatyar was also deceived by Ashraf Ghani and his sponsors and the surrender agreement and other promises were just a mirage. In May 2017, General Dostam – the so called first deputy of the stooge regime accused of sexually abusing Eschi – was expatriated to Turkey. In the same days another member of the bogus parliament from Bamyan province demonstrated his powers beyond the law. The supporters of Shahidani barred an airplane of Kam airlines from landing at Bamyan airport because this plane had not waited for the aforementioned parliamentarian in center and had taken off. In the meantime, severe verbal clashes raged between Atta Noor and Hikmatyar when they taunted each other for their past and present felonies. In the closing days of May, a mysterious blast of a tanker took place near Zanbaq square in the heart of Kabul which instigated widespread protests and anger of masses against the inefficiency of the stooge admin in securing the life of civilian people even in the capital city. In the beginning of June 2017, the above mentioned demonstrations, the fortified tents and ‘Ratakhaze Change’ named civic societies and their flags formed the news headlines in media. The stooge admin tried to control these protest by bullets, in which the son of Ezidyar, the deputy head of so called senate was killed. On the following day, another mysterious blast took place in the funeral ceremony of the above incident. And Salahuddin, the head of Jamiat party, directly accused the so called national security council of Kabul and Hanif Atmar for these tragic incidents. This brawl had not cooled down yet, as severe fighting broke out between the unrestrained armed militiamen of Hizb and Jamiat in Takhar province in which 22 people were killed. During June 2017, two other opponents of the stooge admin appeared. Rahmatullah Nabeel, the former intelligence head announced a new party called ‘Mehwar’ (i.e. the axis or pivot), while Dostam, Muhaqqiq and Atta Noor announced a new alliance called ‘Nijat’ (i.e. the salvation) in Turkey. They warned the stooge admin about widespread protests if their demands were not fulfilled; the puppet regime raised the issue of Eschi and on the other hand, Dostam’s plane was also barred from landing anywhere inside Afghanistan and was instead diverted back to Turkey. In these days, media reported that the heterogeneous stooge setup headed by Ashraf Ghani is still deeply involved in corruption as 20% of custom revenues go to pockets or bank accounts of individuals which was a huge loss for the country and its deserted people. At end of June 2017, Washington Post published a detailed article that the mercenary forces of puppet regime are widely involved in sexual abuse of young boys. In the meantime, the body guards of Muhaqqiq opened indiscriminate fire on participants of a wedding ceremony and ruthlessly killed the bride. In August 2017 one of the strangest incidents took place. Asif Momand, a member of the so called Balkh provincial council had some longstanding differences with the stooge governor of the respective province. While wanting to return from Kabul to Mazar Sharif, he was detained by the unrestrained armed militiamen of Atta Noor. He was then taken to Atta Noor who initially severely beat him and then bit off his ear. Asif Momand appeared some days later in front of media while his head was bandaged and his left ear was torn. In September 2017, fliers dropped from American planes in Parwan province contained images of ‘the creed word of Islam’ on a dog’s body. This untoward incident provoked widespread public protests but they could not wake up the sleeping or even dead conscience of stooge authorities of the puppet regime. In the same month, Ashraf Ghani appeared in the UN conference where he only addressed some of his own colleagues while most of the remaining seats were vacant. In the meantime, a letter of Sawabuddin Makhkash (an official of the so called presidential palace) was exposed, revealing the deep ethnic and racial differences prevailing inside the palace. This issue had not yet cooled down when SIGAR (the special inspector general for Afghanistan reconstruction) released another report stating that the widows of the killed forces are asked for sexual bribe by the vicious officials of the heterogeneous setup in return of financial aid from their respective organs. Though it was a highly sensitive issue but it still failed to stir up the dead consciences of stooge heads of the puppet regime as they were either busy in their personal vested interests or they were helpless in addressing and solving such provocative issues. In the beginning of October, two significant incidents took place. In one case, the military post of mercenary forces in Grishk district of Helmand province was deliberately bombed by the savage American invading forces, killing a total of 20 soldiers including commander Torjan. On the other hand, an armed man killed several American people at a party in Los Vegas. But the astonishing thing was the reaction of Ashraf Ghani and Dr. Abdullah regarding these similar but separate incidents. Both of them neither expressed their sympathy for the bereaved families of their forces nor raised any complaint against their American masters. But on the contrary, they released lengthy messages of sorrow and condolences about the incident in Las Vegas by deeply sharing in the American grief. In the meantime, surveys conducted by an international organ revealed that the heterogeneous stooge regime is completely failed and inefficient and Afghanistan is facing one of the highest famine ratio despite the huge amount of international funds provided over the years. John Sopko, the head of SIGAR announced that the number of casualties of local mercenary armed forces have significantly increased and the stooge admin in Kabul and their American masters have agreed not to reveal the real number of their casualties and losses from now onwards. On the other side, the power supply company in Kabul said that high ranking stooge officials owe nearly 10 billion Afghanis and they have not paid their electricity bills for years. On Monday 23rd October, both Ashraf Ghani and Abdullah went to Bagram airbase to meet the American secretary of state Rex Tillerson. The people working in the so called presidential palace tried their best to bring necessary modifications in the pictures taken in Bagram using photoshop to conceal this embarrassment of the stooge head and his deputy but it was all in-vain as all details of this meeting were published and broadcasted by American media. Another interesting incident of October 2017 was that of Laly Hameedzai and Hamayun Hamayun, two influential members of the bogus parliament violently entered the television archive of parliament by breaking its main gate and went away with whatever record or information needed by them but none of the puppet admin organs bothered themselves with pursuing this aggressive violation within the stooge setup. In the beginning of November 2017, the bogus national assembly decided that two key terms of ‘Islam’ and ‘Afghan’ should not be removed in the newly intended electronic identity cards. In the meantime, a deeply shameful video of Colonel Ghulam Rasool Laghmani, a prominent doctor in the mercenary army, was published in the social media but the officials in the palasilence and the issue was set aside and forgotten as usual. In the meantime, a new controversy started between Arghandiwal and Hikmatyar, as the former claimed that the later one has no right to register a party called Hizb-i-Islami in ministry of justice because this party title was already registered and occupied by him in the relevant department. On the other hand, the United Nations announced that poppy cultivation has significantly increased by 87% in Afghanistan under the surveillance of American invading forces and their stooge Ashraf Ghani. And the so called national assembly blamed the palace for promoting ethnic and racial biases on national level. The stooge deputy head of chief executive office defended and declared support for Afghan nationals who were sent as mercenaries by Iranian authorities to the ongoing war in Syria. At this critical time, a letter was revealed which was formerly issued by the public admin headquarters stating that a new force should be developed from other ethnicities except Tajik people. This untoward incident had severe reverberation among the masses but no tough and efficient action was undertaken to prevent the repetition of such felonies. The last hot news of last month of last year was an anti-stooge-admin gathering in Kandahar province. In this meeting several members of the supposed parliament were to participate. The governor of Balkh province, the son of General Dostam and some other influential people wanted to participate travel to the meeting but their plane was not allowed by the stooge authorities to take off from the respective airport. Zahir Qadeer announced an ultimatum of 12 hours for the stooge admin but could not dare show any visible reaction even with the expiry of the aforementioned ultimatum. In this month, a statistical report of a regional area study center stated that 67% people of Afghanistan are of the viewpoint that Ashraf Ghani is least interested in bringing and restoring peace and stability in the country. In this month, the female hostel of Afghan-Turk lycee (an institute of higher secondary school level) was raided by forces related to the so called national security directorate, in which some female teachers were kidnapped. This felonious act of the national security organ was called a highly sensitive issue and a grave violation of all Islamic rules and Afghan traditions just like all their previous violations, but no one was held responsible for this incident. The year 2017 came to an end while tensions between Ashraf Ghani and Atta Noor peaking as the whole stooge setup is completely drowned in its internal brawls under the atmosphere of complete uncertainty. On the one hand the resignation of Atta Noor was accepted by Ashraf Ghani and a new governor was appointed for Balkh province, but on the other hand Atta Noor will not give up his seat and will not leave so easily. This has brought into question the authority and status of the people in the presidential palace. It is still not clear who will come out as winner in this tussle between palace and Atta Noor!! !